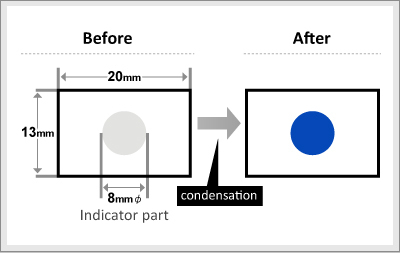 DEW LABEL® single-use indicators irreversibly change its color from gray to blue to signal that dew condensation has occurred. DEW LABEL® changes its color by getting wet and the color stays even after drying. Self-adhesive and easy to apply various location. Do not rub the indicating part. This may cause abnormal color change. Applying excessive moisture causes color pigment to flowing out from the indicator and it colors surrounding area. Avoid using under direct sunlight. This may fade the color of indicator. Indoor use: 1 year Please use within one year after the purchase. Do not apply in high temperature and humid environment. Do not use under direct sunlight for long period of time, it deteriorate the quality of indicator. Direct sunshine fades the color of indicator. DEW LABEL® is not intended for use on humans. 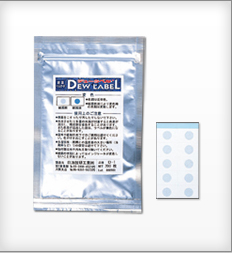 DEW LABEL® contains no toxic substance according GHS classification. DEW LABEL® doesn’t contain chemical substance prohibited in the RoHS directive.